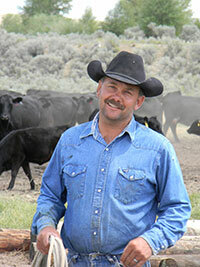 Feed Efficiency in Beef -- There is a Genetic Solution! Lucky 7 Angus measures feed intake with a state of the art "Grow Safe" feed efficiency test system, one of the few owned solely by a seedstock producer. Great strides have been taken in every aspect of efficiency in agriculture, except in the area of genetic feed efficiency in beef cattle. They have done it with chickens. They have done it with hogs. They have done it in the dairy industry. And yes, it will happen in the beef industry!! 68% of the operation costs on your ranch are allocated to feed cost according to a Kansas State University study in 2009. Look at feed efficient genetics in the feedlot. As you read the numerous bull sale ads. So many of them advertise some sort of feed efficiency, but have no data to prove it. This makes it confusing for folks. Hence Lucky 7 Angus has felt it necessary to define feed efficiency. "Feed efficiency is the ability to either maintain, or gain body weight, on less feed than another animal in the same environment. It therefore must be proven by measured data. There are two types of feed efficiency. 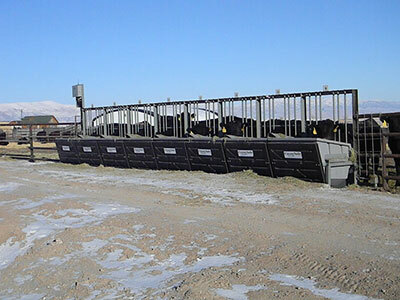 Gain in the feedlot with best feed to gain ratio and cows on grass or hay that eat less while producing the same size or larger calf. 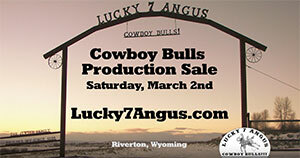 Lucky 7 Angus is the only seed stock producer in the nation that proves out both. Proven feed efficient genetics will do more than carcass and calving ease combined. It's not about starving a profit out of a cow, but about producing more pounds of beef on your ranch with the same input costs. Feed efficient genetics will raise more pounds with less cost which will give you an extra opportunity to profit. To summarize the data; This year's Lucky 7 Angus yearling bulls are eating 39% less calories than our competitors' bulls/industry standard. 14.3% less than last year and 34.6% less than they ate 10 years ago. The 2 year olds are eating 38.6% less than our competitor's bulls/industry standard. 13.5 % less than last year and 34.6% less than 10 years ago. To go a step farther, these incredible results are also being accomplished with our cow herd while grazing. 1000# First calf heifers: Industry standard is 22 pounds per day to maintain. This year our Lucky 7 Angus 1000# heifers did the same on <10.22 pounds/day, last year <11#/day and 2005 it was 16 # per day. 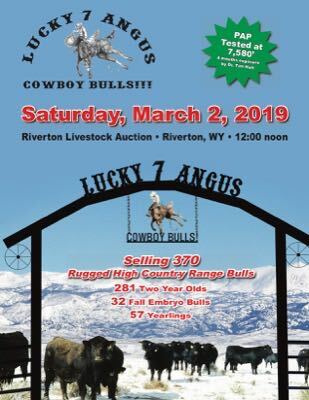 Or, The Lucky 7 Angus proven feed efficiency heifers can maintain body weight with 54% less feed than industry standards. They are 7.1% more efficient this year than last, and 36.2% more efficient than 10 years ago. Plus it is being proven in both the feedlot and out in real world conditions. This data and results cannot be boasted by any other seed stock producer! The first ranchers on board will control their own destiny. The rest will???? Tough to say, but the producers in the hog and chicken industry that were not progressive went broke. I'm telling the truth here. Does chicken, pork or milk taste better today than it did 30 years ago? The answer is "No". Economics 101 They created genetics that can do more on less! Or they are all bred for feed efficiency alone. Get on your website and look up the feed conversion for hogs, chickens and beef. You will find hogs are 3.0-3.2:1, chickens 1.9-2.1:1 and then there is beef cattle at 5.5-13:1. You see we are missing it. The cattle industry is way behind our protein competitors. Why? Because the people creating the genetics, or seed stock producers, for 40 plus years have put their genetics in glass bubble/all you can eat environments. It was easier to be great promotors of fat pretty bulls with some sort of emotional number or phrase, than to do the extensive work and scientific testing necessary to find the profitable ones. You have been let down by the people you considered experts. Experts alright, expert marketers.